Being a great leader requires many skills – most of which are soft skills not taught at school. So, what leadership skills do we need to know and how do we develop leadership skills? Nature – our personality, our natural preference. I’ve had many great professional leaders, mentors and role models. I’ve also had my share of terrible. For example – one of my last bosses was never open to sharing clearly defined goals and working with the team to define and agree on clearly defined tactics. It was so bad that if ‘the team’ thought we did grasp a project vision, we were not surprised when (not if), he came into work with whole new approach… and had rewritten the previously crafted materials and strategy to fit with his new vision. Leadership side-note… there are many articles written about how people don’t leave companies – they leave leaders. I know the last 2 leaders I had were key to me leaving the last 2 companies where I worked. I guess I should thank them. Historically a persons analytical skills and education has been the key deciding factor when selecting / promoting leaders. This gives very little (if any), consideration to their soft skills or emotional intelligence (fathered by Daniel Goleman) . I could go on and on about how what not to do, but I’d rather discuss positive things great leaders know and do. So, here we go. They realize that not every decision has to be their way. When a collaborative team makes a decision – as long as it meets the goals it should be accepted – even if it isn’t the way the leader would do it. Great leaders hire people who will stretch the creativity of the team and the business… and who will also be stretched by the work and experiences. They are both firm and fair with their expectations and holding people accountable. They admit to their mistakes – and they call others on theirs. They see mistakes as learning opportunities – which likely includes coming up with options on how to recover from them. They give credit where credit is due acknowledging other people’s success openly and proudly as well as the team’s success. Note: They do not take credit for others work or overstate their own successes. Their word and their integrity is critically important to them. They listen to everyone – because everyone has value and a unique perspective. They have a positive outlook. Rather than having to meet with a client – they believe they get the opportunity to listen to their client needs. They are empathetic and compassionate – they understand that sometimes rules need to be bent to support the individual… be it client or coworker. They appreciate hard work as much as smart work – because hard work builds dedication and loyalty. They are smart and confident. They have knowledge and expertise and they are comfortable sharing it with their people if / when it benefits the greater good. They never use it to grandstand. There are a lot of moving parts to being a leader… and many of them are soft skills – behaviours that require leaders to be confident and secure in their own abilities – and to feel really comfortable giving up power and helping to build others abilities / experience. So what we see is that a great leaders technical skill has little to do with the things great leaders know and do. Great leadership is about the values and soft skills / emotional intelligence we learn from our family, friends, teachers and even media. Great leadership is also about the values and soft skills / emotional intelligence we learn from our mentors. The way I see it, by giving up power a great leader earns power and respect. Employees who work for micro-managers become stale, unimaginative and ultimately bored (which leads to them quitting and the organization losing everything they’ve invested in that person). We also see that in many cases, being a mindful leader is about being mindful at work, knowing your triggers and practicing empathy and compassion. Being a great leader is something we can all ‘do’. And we are going to make a mistake – but as stated above leaders acknowledge their mistakes… just like they acknowledge and forgive not-to-frequent mistakes of their employees. If a leader was seen as being strong on both results and social skills, the chance of them being seen as a great leader rose to 72%. Personable, respectable leadership skills are crucial to your professional success. This doesn’t mean you have to be soft; absolutely not, you do have to hold people to account. Knowing how to have difficult conversations is part of being a great leader – just like being a great mentor. People will respect when you are fair – and they will respect when you hold them to task – what they wont respect is a dictator who drives a moving target or who doesn’t respect their staffs work / time / career. Emotional intelligence and soft skills are key to a leaders’ success. For a leader to development co-workers or clients, the ability to communicate is a key to success. Happy communicating, learning and leading. Please share and/or Tweet this post if you like it. It’ll only take a moment and will help us both share thoughtful business best practices. Some popular ‘It Feels Good To Share‘ links are at the end of this post. Collaborative Leaders are essential to create and sustain an environment where employees work in flexible, dynamic teams. Under the leaders guidance and support, collaborative team members respectfully share information, decision-making, responsibility, learning and recognition. And while collaboration thrives in a flat environment, it still requires strong leaders. Collaborative Leaders guide highly effective team members to jointly reflect on their work habits and best practices in order to refine their approaches and abilities. Leadership creates and maintains the fundamental requirements for effective team collaboration. Apart from getting out of the way of creativity and decision-making, one of the key roles of a Collaborative Leader is to make sure everyone understands the organizations values, strategy, key messages and goals for the project. Clarity in these areas will give team members confidence and a sense of direction. 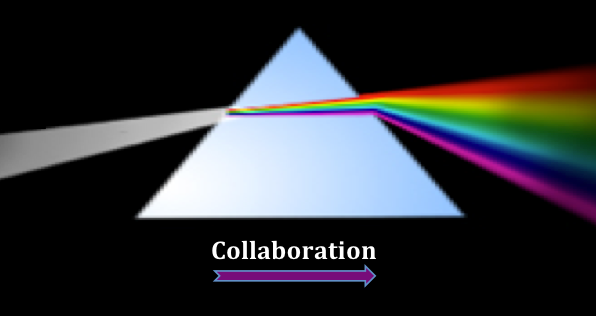 Collaboration must be supported and demonstrated by upper management. Team Members must have equal voice… and equal opportunity to ask questions. All discussions must be documented and shared. Every collaborative team requires a Collaborative Leader. The role of the Collaborative Leader is one of monitoring, guidance and mentoring. A Collaborative Leader offers discipline; keeping the team on task – encouraging and maximizing the value of each other’s abilities and learning potential. If the team gets stuck, it’s the Collaborative Leaders’ responsibility to find creative ways to encourage fresh ideas and renew momentum. Collaborative Leaders keep the team talking and moving forward – influencing their behavior not controlling their behavior. Leaders also share big-picture knowledge and acquire senior approvals. Collaborative Leaders work together to create diverse teams, adding talent with diverse backgrounds and from multiple departments until the goals are met – at which point the team will be formally disbanded. Team members are selected based on collaboration history, (identified during a BEI). People who strive for political gain or reward are destructive to a collaborative environment. Not all employees will be comfortable with collaborative environments – especially the focus on individual and team learning, contribution, recognition and reward. That’s OK… Collaborative Leaders must have the confidence to pass on including an industry expert if that expert would not support a collaborative team. Those same leaders will be reassured that the firm will continue heading in the planned – positive direction. Collaboration is a long-term investment. Normally a collaborative team will make its own decisions on how to move forward. Employees / team members debate and share until the best combination of ideas are approved. If the team cannot come to agreement and the current objectives are at risk, it becomes the leaders duty to make a decision… although it should rarely come to that. Whether the team makes the decision or the leader, once a decision is made every member of the team understands that the decision is to be 100% supported by the team and to move on. A study by a leading HR consulting agency has identified five employment factors that increased employee commitment and employee retention… which translates into higher productivity and lower cost (including turnover related costs). All of these five employment factors are natural extensions of collaborative work environments.